Postcard to Mrs. R.B. Layton, Medicine Hat, Alberta, [crossed out and re-addressed to Bentley, Alta.] mailed from Scotland. 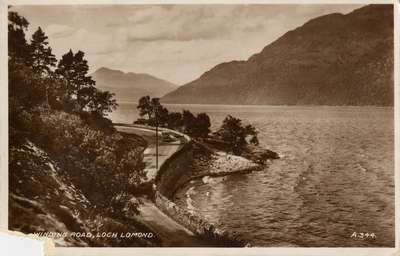 Loch Lomond is the largest lake by surface area in mainland Britain. Peg and I have spent a very lovely day at Loch Lomond and Loch Katrine in the Trossachs. We returned from Ireland yesterday where we spent three glorious days, visiting Portrush, The Giant's Causeway, Whitehead and Carrick Fergus. Our trip to London was equally pleasant, and we are both enjoying our holiday very much. Hope you have a nice vacation.